In Ghana’s Northern Region town of Damongo, there is a young man who exemplifies the ideals of “waging peace.” Prince Abubakari A.S. Gbanso. Gbanso, as we call him, was trained as one of our Youth Peace Ambassadors and was a participant at the Tamale Inter-faith Peace Summit in August. Gbanso is a very engaging individual who focuses daily on promoting peace for his people, his area, and his country. His energy and determination is infectious, as evidenced by his success in starting the Damongo Peace Ambassadors Club and growing membership to 350 youth in less than three months. Here, Muslim and Christian youth gather regularly to recite a peace pledge, to go out to their peers to promote the concepts of peaceful resolution of conflict, and to actively participate in their communities and in their upcoming election process. His aim is a thriving and peaceful Ghana. Gbanso, who is an artist, spends a good deal of his waking hours engaged in promoting peace. But he understands that sustainable peace relies on economic opportunity for his peers. He understands that his efforts at preventing radicalization leading to violent extremism are made doubly hard if his peers do not have a future that is meaningful and prosperous. So, Gbanso came to us with an idea: taking his talents and skills at artistry and printing, he could start a business that would train some of his peers in these skills and would supply a variety of printed products for the community, the region and the nation. 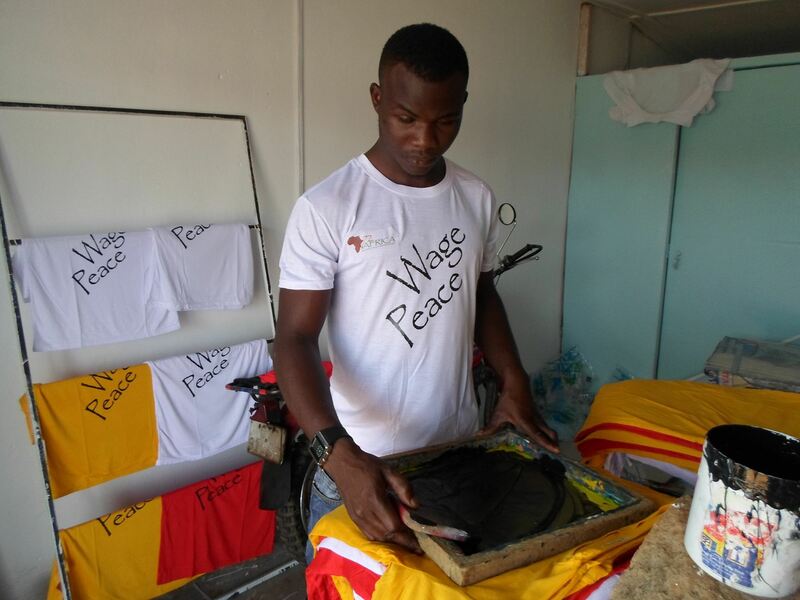 He plans to put a priority on “Wage Peace” related materials and we’ve decided to invest in such an enterprise. Gbanso helped us during the Tamale Peace Summit by designing and printing banners and posters, and printed up Wage Peace t-shirts for post-summit activities. In the process, he has gotten other youth interested in the process and they see an enterprise that is viable and prosperous. 72 Africa is supporting Gbanso by supplying investment funding to secure a facility with a storefront in Damongo. More investment will be needed for materials, to set up the distribution process, etc. Further, Gbanso sees the potential for additional shops in Ghana, and perhaps in other African countries, which are youth-based and promote the messages of peace in support of 72 Africa’s work. We agree, and hope that you will consider helping us spread hope through support of this effort. The impact of Gbanso’s business is multifaceted and holds great potential for positive impact on many youth in this region. The specialization in peace messaging allows for long-term impact and interest among youth, which helps support the foundation laid for sustainable peace in the region. Through this effort, youth feel as though they are having a direct impact on their society well beyond their peers. Our support of Gbanso also sends a specific message to youth that hard work and commitment has rewards, and that their own ideas, ambitions, and dreams can pay off in securing their own futures. As this business grows, we expect that it will eventually be a mainstay of economic prosperity to Damongo.